WILMINGTON, NC, January 26, 2016 – Research issued by the U.S. Department of Energy’s Lawrence Berkeley National Laboratory confirmed that an installed solar system increases a home’s value by a concrete amount and homeowners will pay more by choosing not to go solar. 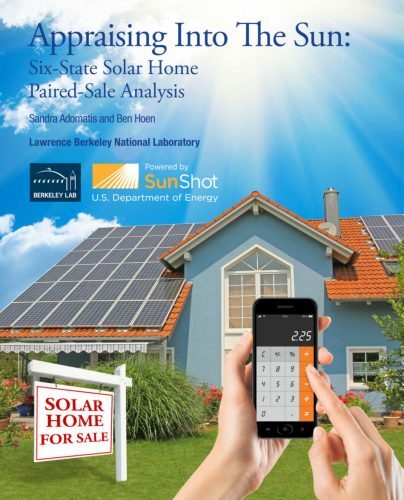 Authors Ben Hoen, a researcher with the U.S. Department of Energy’s Lawrence Berkeley National Laboratory, and Sandra Adomatis, appraiser and owner of Adomatis Appraisal Service in Punta Gorda, Fla., issued a report “Appraising into the Sun: Six-State Solar Home Paired-Sales Analysis.” The study from November 2015 examines a sample of home sales in California, Florida, Maryland, North Carolina, Oregon and Pennsylvania and aims to support real estate appraisals with data regarding a premium for homes with installed solar panels. “In the past we have presented to our customers the fact that solar increased home values based on data that came largely from California, which left many of them suspicious as we are not California,” highlights John Donoghue, president of Wilmington, NC-based Cape Fear Solar Systems, LLC. “The premise was simple and basically universally agreed upon: homes that cost less to operate are worth more. Solar reduces the operating cost of your house by lowering your electric bill. What was not agreed upon was by how much a solar system increased the value of your home. That has changed with this new research,” Donoghue adds. It is great news for the local solar market, as now there is data from the Raleigh area numerically demonstrating that solar adds more to the value of a home than the after tax credit cost. The study concluded that the average home value is increased by $2.68 for every watt installed. The average after tax credit cost of a fully financed solar system installed by Cape Fear Solar Systems costs $2.65 per watt, which is less than the value added. Therefore, a local solar panel installation costs less than the added value to your home, according to the data from Raleigh, NC. Another interesting point in the newly published research is that out of all the analyzed markets, NC comes in with the lowest price per Watt of added home value for PV installations. This is great news in the relation to the rest of the country, as no one can say NC is artificially inflating the numbers or blowing them out of proportion. NC has the lowest added value and it still adds more than the after tax credit cost of the system. In the case of the average installed systems size, a local homeowner going solar will pay an after tax credit cost of $2.65 per watt and get $2.68 per watt added to the value of their home, without taking into account monthly energy savings. This research demonstrates that homeowners basically get a solar system at a net cost of zero, and wind up with monthly tax free savings.